Ahhh…Resident Evil. That treasure of the survival horror genre, the game that started all those off-shoots, most of which have incredibly dark situations. But not Resident Evil. Resident Evil is the ode that Capcom made to Stephen King’s The Stand, and this, too, shows in the biohazard gone awry plot line. (Funny enough, but the name of the game in Japan is Biohazard.) The game has a complex backstory which is looked at in RE0, the Gamecube-exclusive RE game that shows where it all started and why the mansion incident occurred. There is an elite team, known as S.T.A.R.S., a squad that consists of two teams, Alpha and Bravo. It is sent to the sleepy American burg of Raccoon City, where there have been murders occurring that are, currently, unexplained. 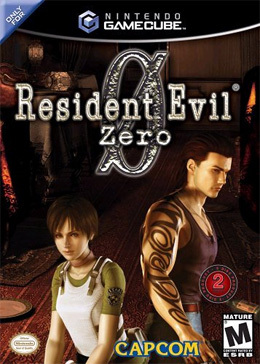 But the truth about the murders is soon to come into the light… Rebecca Chambers, a rookie with the S.T.A.R.S. Bravo team, is involved in a violent helicopter crash that the team is in. Everyone survives, but they find a heinous murder which a convict named Billy Coen allegedly committed, along with 23 other murders. Knowing the danger, the team splits up into the woods, and Rebecca soon ends up at a stopped train, a train that has no lights, no life . . . . Eventually, Rebecca will end up teaming up with the convict, if only for survival purposes, because that train that they are on is full of zombies, undead dogs, and leeches, leeches which carry a virus that infected the entire train among other, more gruesome hazards that are sure to push you to the edge of sheer terror. Are you hooked? If I give any more of the plot away, then the game will mean nothing to you. But this is only the first twenty minutes. Oh…my…gosh…these are the most amazing graphics you will see on any system these days. True, other games may come out in the future that have better graphics. but the still, prerendered environments make the game look so realistic that you may have to check behind your shoulder once or twice to make sure that the Night of the Living Dead isn’t occurring behind you. This allows neat effects, such as a leave rustling in the moonlight, or a reflection of the character you are playing as in a puddle of water. The environments have had such care taken in constructing them that it might make you think that the character models are junk. Not so. The character models look as good, if not a little under, the cutscenes, which themselves are nothing to scoff at. All of this, of course, leads us to the animation! It is done especially lovingly in RE0, with feet hitting the ground in time with footsteps echoing through the corridors. If you look hard enough, you can even see rain hitting the windows on the train, or wind rippling a window shade. Lip movement is synched to actual speech, so there are no Godzilla-type errors in terms of believability that the voices were actually recorded in English. Overall, RE0 is a very solid game graphically, with some of the best special effects seen on any system. Resident Evil 0 is not an action game. Okay, it sorta is. But not completely. If that makes sense…what it really is is a action/survival-horror/puzzle/adventure/graphic adventure game, and that really does not make sense at all, but here goes. The game has tons of action in terms of boss battles, zombies, evil dog thingies, jelly zombies, crows, centipedes, leeches, scorpions, heck, even rabid monkeys. But they are usually few and far between sequences. The survivial-horror aspect comes into play when you start running out of ammo, are in a room full of zombies, off the last one, run into the next room, hoping to find more ammo, and end up stomping on the head of a zombie that grabs your foot, only to see two more zombies rising up to try and get you. And still no ammo. ‘Well…poop,’ is probably going to be the general comment in this situation. Then comes the puzzle part. There are some difficult brain stumpers here, but, in all reality, the game is not brimming with them. It just means that you can’t advance if you can’t solve the puzzle, thus ending the game for you, until you find a guide. The adventure part is just because of the caves and the rooms that have a guy with a fedora and whip…okay, not really, but the game does sort of go under the adventure genre. Finally, graphic adventure. Why should I choose this? Mainly because the game is such that it makes you solve some hard puzzles with items that have little to no explanation for, at all, period end of sentence. This really doesn’t scratch gameplay. What gameplay ends up being is a frantic time, running through a mansion without ammo, being chased by zombies, all while trying to figure out an insidious conspiracy and solve puzzles that open secret passages and such. That’s pretty much it. Doesn’t sound like fun? Well, it is, even though the gameplay might not be the strongest suit, it still is pretty good. Probably the scariest part of the game. The sound has beautiful music that goes along very well with the situation that you find yourself in, and it also can add great suspense and/or fright to a moment where there’s a zombie that you don’t expect to be there. Enemies also make some pretty weird and frightening noises, ranging from disturbing groans to growls, to howls, to hisses…anything that might scare you, it’s probably in the sound of this game. Footsteps sound great on different surfaces, and really add some atmosphere to the game. Other ambient noises are also in effect, such as the train roaring by the countryside, or a faucet dripping, even the steady hum of flourescent lights overhead, they all add a big sense of realism to a game firmly grounded in science fiction. Voice acting is particularly strong, and while there is some of the stupid melodramatic voice acting, it certainly is a step up above some of the other games that come out of Japan, and even here, where the people in the game sound like…I don’t know what they sound like, just not right. Pretty tight voice acting, though, overall. Some say the controls make the characters feel like tanks. Others say that the controls are just plain horrible. I say that after twenty minutes of adjusting, the controls are some of the most intuitive in the situation. You just need to find out for yourself, though, because the controls are just too complex to describe in words. Okay, there is nothing that is wrong with this game in terms of being demonic, about satanism, nothing like that. It is about a bio weapon that gets unleashed on a small town. Nothing that’s particularly evil about that, is there? The problem is the gore. This game, while not the most violent game, is pretty gory. It is mostly just blood that shoots out, but you can see through some of the zombies, and you can also see the encrusted blood on the dried skin that the zombies possess. Nothing like organs or anything. There is no bad language that I heard, so don’t worry about that. This game is great for middle-to-late teens and adults looking for a scare, and those who don’t have a problem with zombies. Don’t take this to mean that all survival-horror games are like this. Just the RE series. And please don’t pick up the Silent Hill series or Eternal Darkness. Those are evil, and not good for a Christian to play.